"Have you been to the Boardwalk area of Kemah in the last few years? There has been phenomenal development there, with Joe’s Crabshack, Landry’s, Saltgrass Steakhouse, etc. There are many amusement park features there as well. Since Ed grew up just a couple of blocks down the road from that area, and his dad owned a boatyard there too, it has special sentimental significance to us. 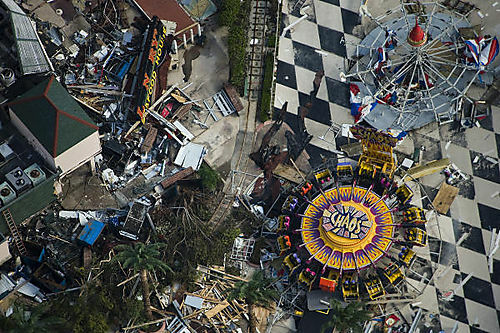 Well, this photo shows what is left of that area after Ike left town. The name of the ride at the bottom center of the photo says it all!!! CHAOS! Karla"